Metropolitan Water District of Southern California (MWD) is a regional wholesaler providing drinking water to nearly 19 million people at a rate of 1.7 billion gallons of water per day. 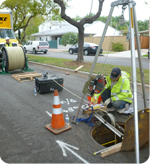 In March 2013, (MWD) completed approximately 8 miles of electromagnetic (EM) inspection on a 78-inch water transmission main. EM inspections locate and quantify the amount of wire breaks in PCCP pipelines, which is one of the main indicators that a pipeline will eventually fail. The project also included visual and sounding inspection, structural curves and Acoustic Fiber Optic (AFO) monitoring installation for 4.5 miles of the transmission main. The visual and sounding is used to get an immediate assessment on the pipeline and to determine if there are any sections of pipe that are in an eminent state of failure. AFO was installed to monitor deterioration as it happens. The technology monitors the condition of prestressed pipe by recording the amount of wire breaks in each pipe section in real time. The AFO system allows MWD to track pipeline deterioration and together with the structural curves identifies at-risk pipes before they fail. Due to the size and importance of this pipeline, the shutdown window for inspection and installation was very short and required careful planning and execution by MWD. The entire process was successfully completed in less than four days, well ahead of the planned schedule. By combining the data from the EM inspections and activity on the AFO monitoring system, MWD can identify the amount of wire breaks on each section of pipe and prevent costly failures and service disruptions. In terms of reducing NRW, locating leaks on large-diameter transmission mains represents the best opportunity for improvement. Leaks on small-diameter distribution mains are the most common, but the volume of water lost from these leaks represents a much smaller percentage of NRW than leaks on large-diameter pipes. 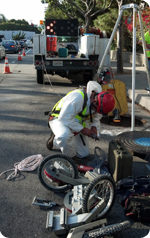 Focusing leak and theft detection on transmission mains is the first step in a NRW-reduction strategy. With over 2,000 miles of large-diameter pipelines inspected, Pure Technologies has located more than 4,000 leaks for an average of 2.2 leaks per mile using advanced inline leak detection technologies. Locating these large-diameter leaks has significantly reduced NRW, saved millions of gallons of water and helped prevent failures for utilities around the world. Providing real-time critical data of a prestressed pipeline allows the asset owner to effectively moniture changes in structural integrity and address necessary improvements. Electromagnetic testing provides the best condition assessment data for large diameter PCCP (AWWA C301) and BWP (AWWA C303) pressure pipelines.